Songzanlin Monastery is located 5 km north of Shangri-La County. It is convenient to transfer from Shangri-La Dukezong Old Town to the monastery. Travelers can take No.3 Bus at the front of Moonlight Square with 30 minutes to Songzanlin Monastery. You can get there by biking (20 minutes) or by walking (about 1 hour). 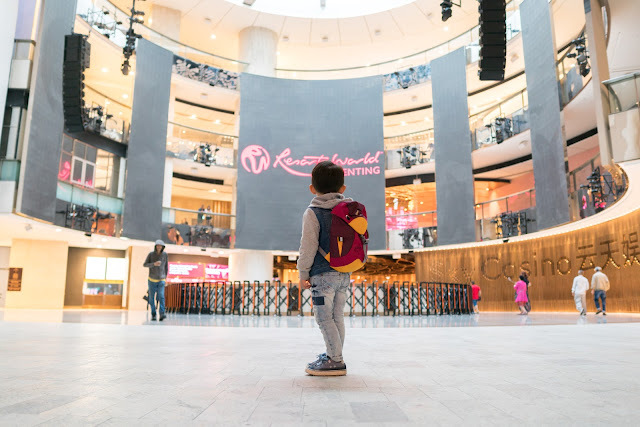 Many minivans are available at Moonlight Square that travelers can hire a van to go there. You need to discuss the price with the drivers before you get on the van. As for me, I signed up for a tour together with the Shika Snow Mountain which just cost me CNY300/pax including transfer and entrance fee. I find this is the cheapest and the most convenient way. The whole Songzanlin Monastery are closed from public vehicles. Only the local residents and vehicles with permits are allowed to enter. 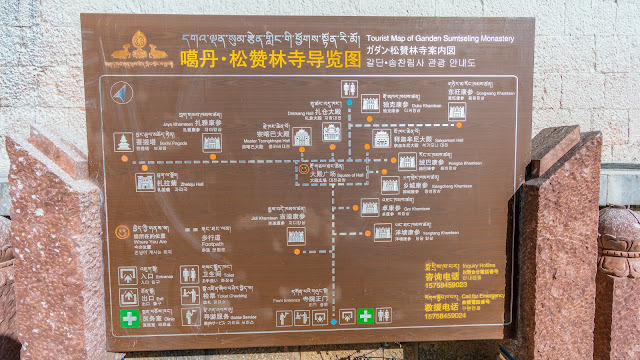 Otherwise, we have to park our car before the entrance and take their internal bus into the Songzanlin Monastery. 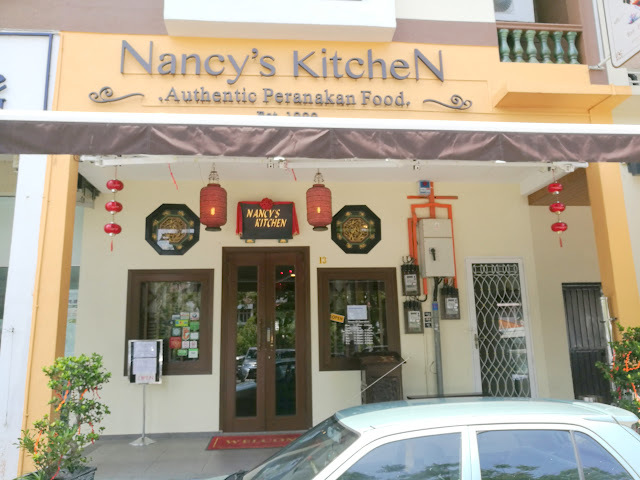 The admission fee is CNY115 including the internal bus transfer. Not cheap at all to visit a monastery but my fee is included in my tour package which is very worthwhile. The only cons is I have a time limit of 2 hours. 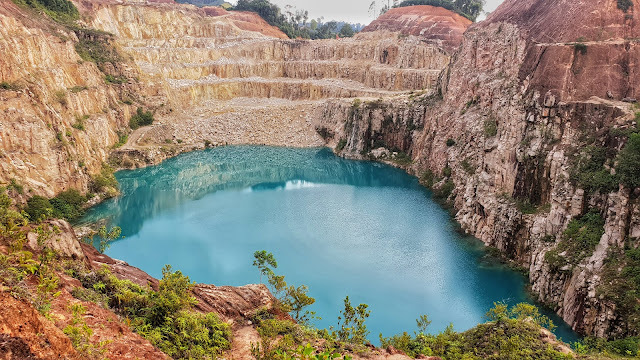 Otherwise, there is no time limit for you to visit this place. You can take as long as you want between 8.00am - 6.00pm. When visiting the halls and eight colleges of Gaden Sumtseling Monastery, travelers should climb 146 steep stairs to reach the halls and temples. At an altitude of 3300m, it can be a little tired to walk up. The ring road of Lamuyangcuo Lake is 2110 meters which takes about 40 minutes by walking which demands your energy to finish it. 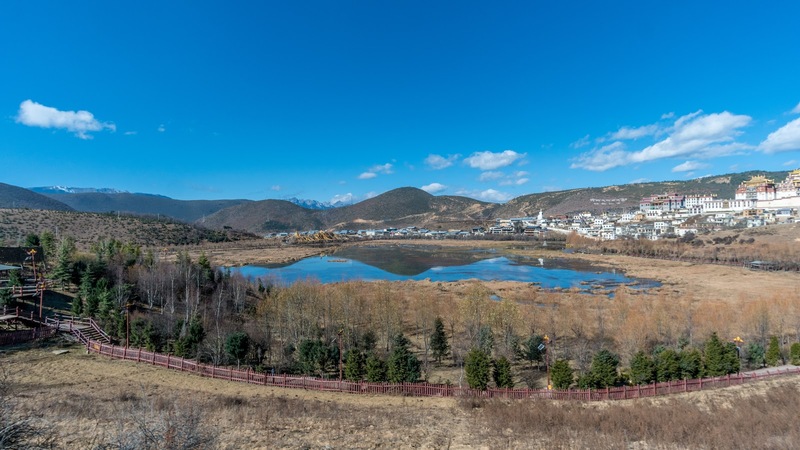 On the way, you’ll pass two best spots to shoot Songzanlin Monastery panoramic view, one is near Conggulong Village and the other is at the central location of the lake. Travelers should follow the clockwise and enjoy the beautiful scenery and shoot along the way. Lamuyangcuo Lake is located in front of the Songzanlin Monastery. Lamuyangcuo, meaning the Soul of Heaven Fairy Lake, is a holy lake dwelled by the soul of Goddess Bandanlamu, a guardian goddess of universe. 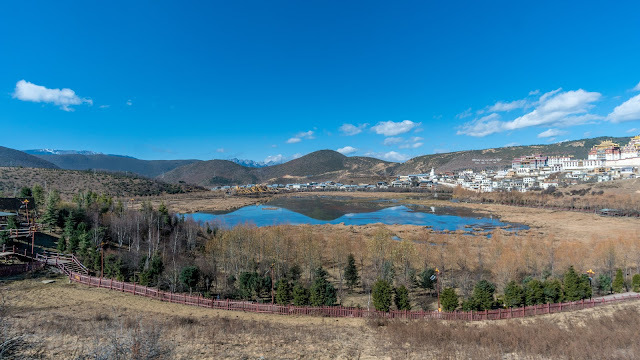 Conggulong Village is located in its east, Xiaojiezi Village and Sacred Dongqusheng Hill in its west, and the celestial burial platform in its south. In every important Buddhist ritual or the occasion of making major decisions, the monks and believers led by the Rinpoche chant sutras and pray around the lake. The believers and followers usually go for circumambulation clockwise in the path around Lamuyangcuo Lake. 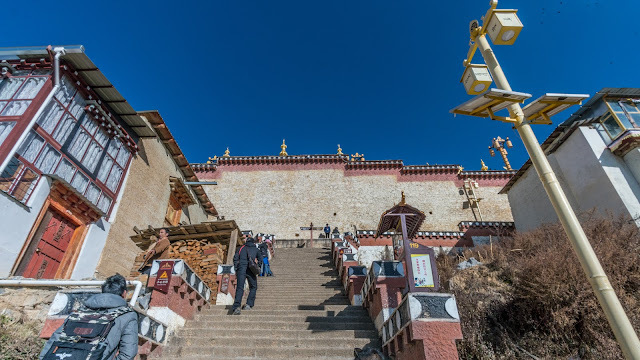 The best location to shoot the panoramic view of Songzanlin Monastery is CongGulong Village Viewing Deck which is located on the road to Lamuyangcuo Lake. The sunrise is around 07:00 and the sunset time is around 20:00. To shoot the sunset view, you’d better arrive early and wait for the amazing view. In the monastery, photographers could shoot Thangka, palm-leaf scripture, censer, light and more. The Lama and pilgrims could come into your pictures. Once you get to the top, you will see a lot of birds flying on top of the monastery. 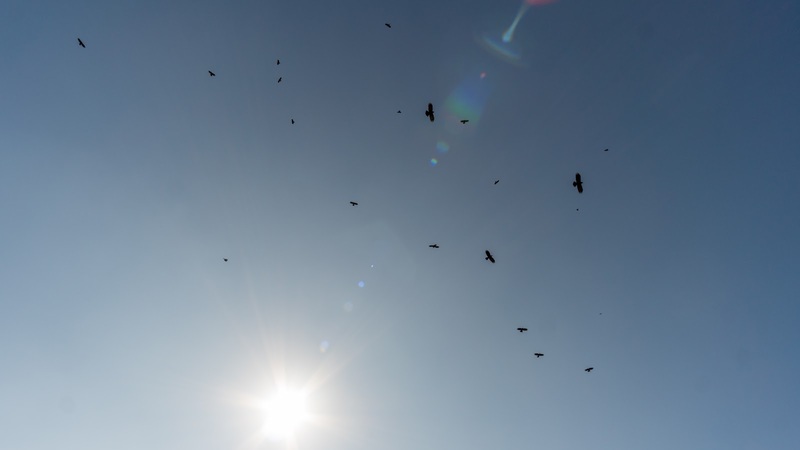 It is their sacred birds. Songzanlin Monastery is a religious site, so travelers should dress modestly, behave with good manner. When visit the temple, please visit by clockwise. Don’t talk too loud, don’t smoke inside the temple. If you want to take photos of monks or pilgrims, you’d better get permission first. And photography is forbidden in the chapels. 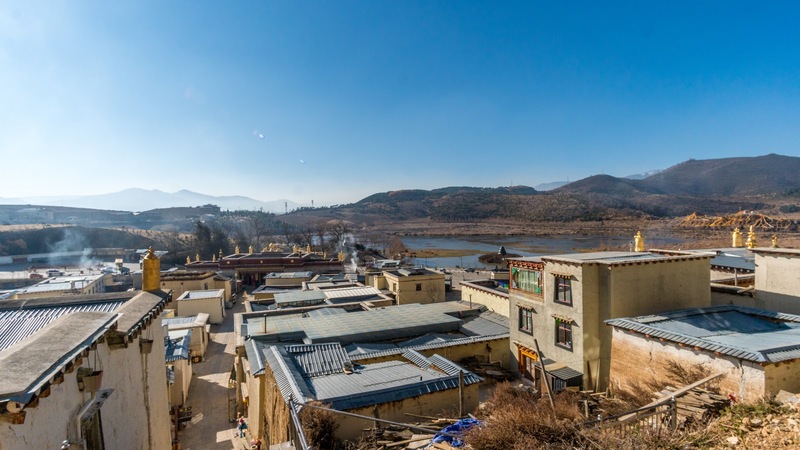 Ganden Sumtseling Monastery is suitable for photography all the year around. There is a grand religious festival called Gedong Festival which is held annually during Dec.26 to Dec.29 by Tibetan calendar. During these days, people with the masks of the horse, cattle, sheep, crow, yak come to the square of Songzanlin Monastery and dance together with a very mysterious atmosphere. While the yak butter oil lamps burn in the hall of the temple and the pilgrims pray very devoutly in the front of Buddha. 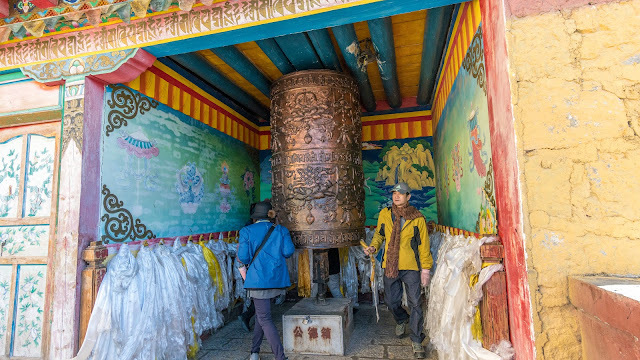 This is a rare chance in Shangri-La to experience the Tibetan Buddhism culture and religion. I went on the winter and lost all the green colors in my photos which is not the season I recommend everyone to visit. Built along the mountains with a magnificent facade, the monastery is a faithful imitation of the Potala Palace in Lhasa, Tibet. 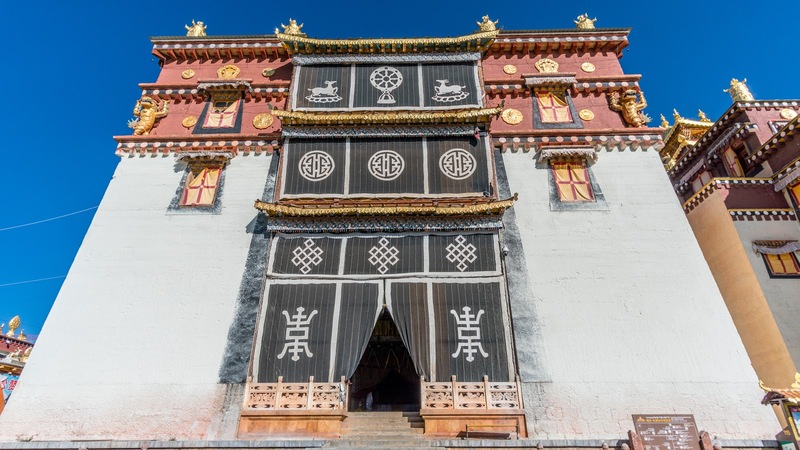 Covering an area of 33 hectares (82 acres), the monastery has solid walls and five gates. 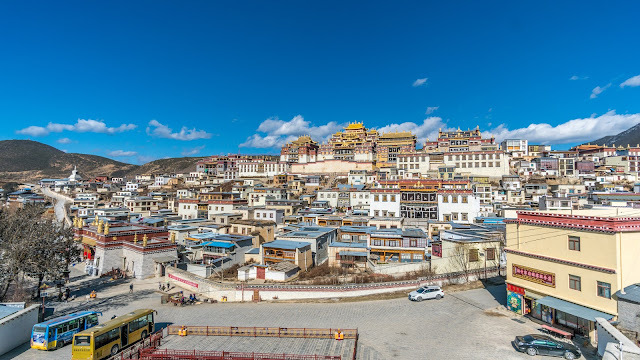 Two main lamaseries, Zhacang and Jikang, command the highest position in the architectural complex. 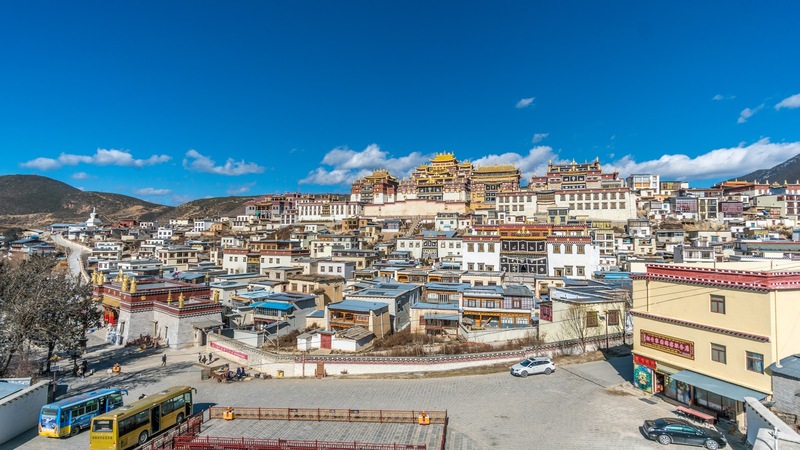 As one of the largest lamaseries in the Kangzang (tri-province area of Tibet, Sichuan, and Yunnan) region, they are both Tibetan-style watchtowers and are surrounded by eight sub-lamaseries and the dormitories or the lamas. A five-story Tibetan-style building serves as the main hall of the monastery. Seen from the distance, the gilded copper stupa and tiles at the top of the structure seem to shine eternally in the plateau sunlight. The lower tier of this structure is supported by 108 giant pillars, a lucky number to Buddhists. 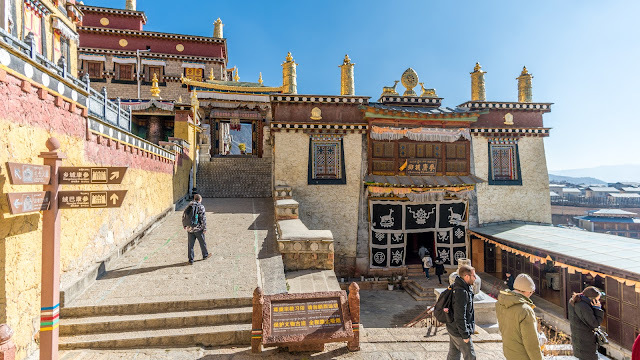 The 16 colorful pictures hanging in the hall are said to have been painted by renowned lamas with a special golden liquid given by the Fifth Dalai Lama to the monastery. Lighted by numerous butter-oil lamps, the hall could hold 1,600 lamas sitting in meditation or chanting Buddhist scriptures. The monastery contains many treasures. The most famous of these are eight gold-covered sculptures of Sakyamuni, fashioned between the time of the Fifth and Seventh Dalai Lamas. In the early Qing Dynasty the Mu Family (rulers of Lijiang) presented the monastery with dozens of bronze sculptures, the Ganzur scriptures hand-written in liquid gold, scriptures written on pattra leaves, gold lamps, and many exquisite gilded silver incense burners. Much of these relics still remain for viewing today. Walk around the Golden Prayer Wheel for three times for good luck. You will find a lot of this in a Tibetan cultured city. 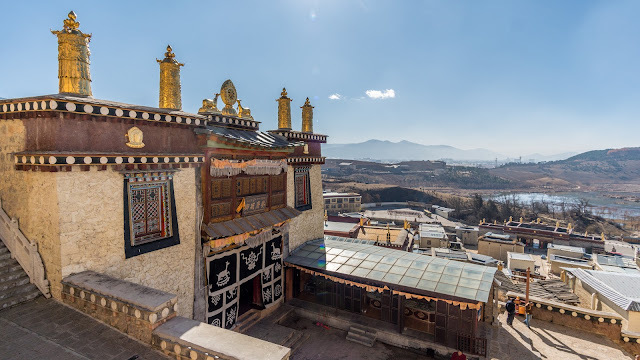 Songzanlin Monastery has another alias - 'the little Potala Palace ', so named because the whole monastery is in the traditional style with mysterious atmosphere. 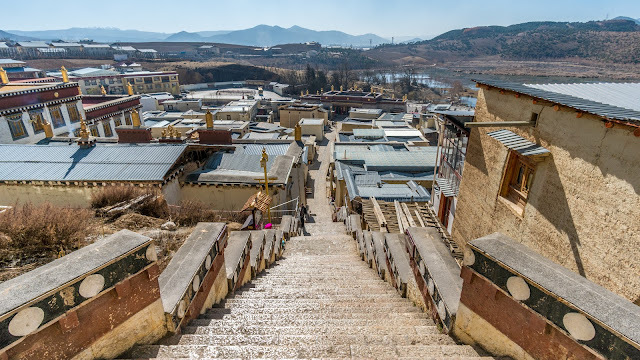 In 1679, Dalailama chose this place by divination, and it went on to become the uppermost public place in Yunan which features the particular local characteristics. Annually, the Gedong Festival is celebrated here by the Tibetans. Pious believers, with their knees and foreheads knocking the ground at every step, come here to pray. In James Hilton’s novel “Lost Horizon”, it describes Shangri-La as a mystical, harmonious valley, gently guided from a lamasery, enclosed in the western and of Kunlun Mountains. 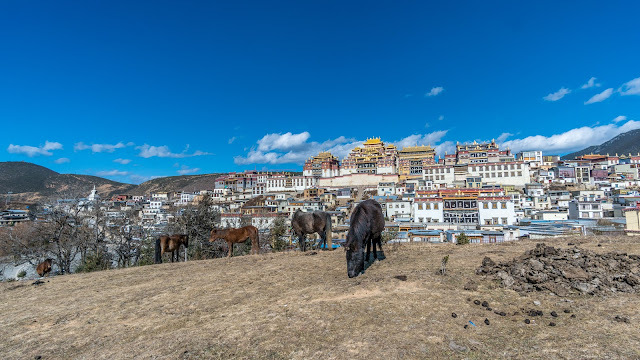 James was inspired by the Shangri-La of the Tibetan Buddhist scriptures, where human beings, animals and nature lived in harmony under the rule of a Tibetan Monastery. 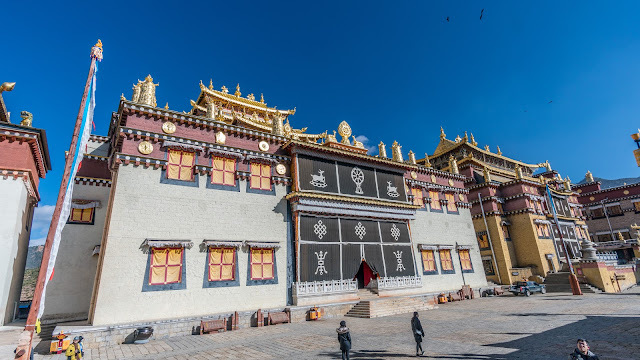 This monastery in Shangri-La is called Songzanlin Monastery, also Ganden Sumtseling Monastery or Guihua Monastery. 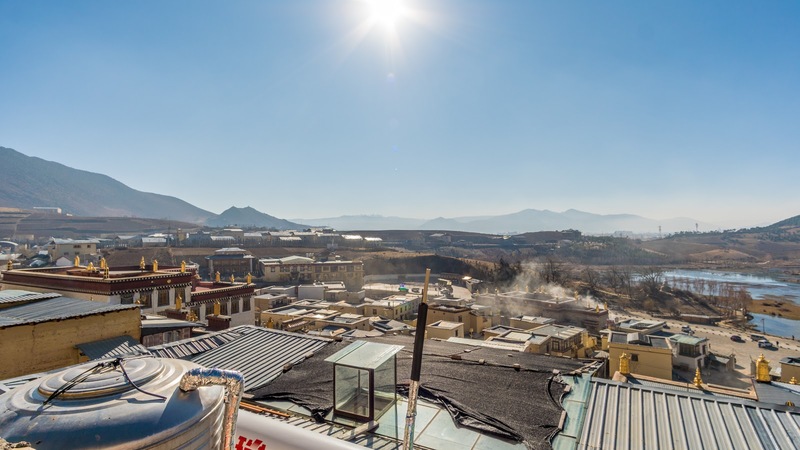 It is the largest Tibetan Buddhist monastery in Yunnan Province which belongs to Yellow Hat Sect of Gelug. It is also the most important monastery in southwest China. Built at the foot of Foping Mountain with a magnificent facade, Songzanlin Monastery is a faithful imitation of the Potala Palace in Lhasa. Hence, it is reputed as the “Little Potala Palace”. Being a collection of Tibetan culture, Songzanlin Monastery is also reputed as “Tibetan Art Museum”. 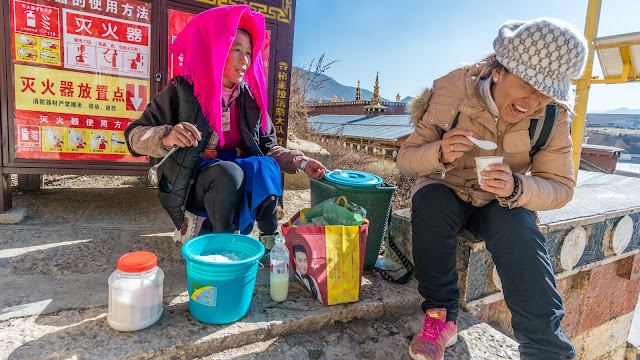 Along the way to the monastery, you will see the locals selling their yak yogurt. 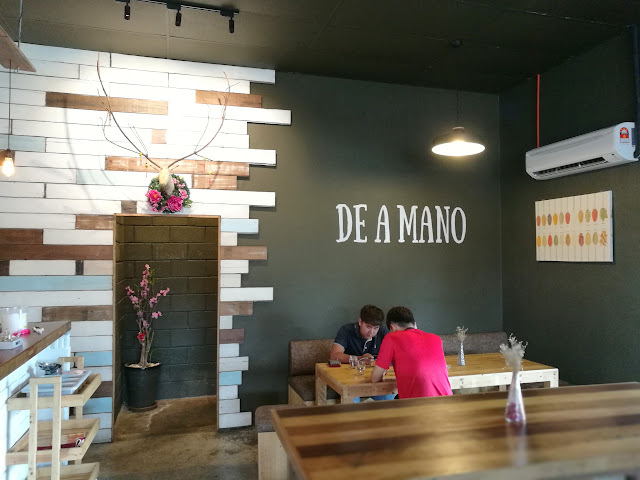 Do try their original locally flavor yogurt. From her face, you should know that how it is taste like. Yummy! Basically you only need 3 hours the most to travel the whole place. 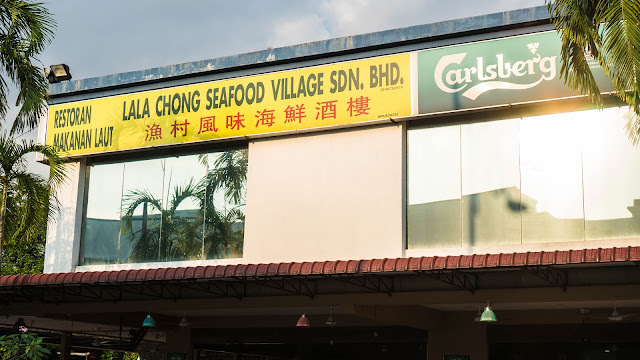 If you plan to visit this place by yourself, better don't! Too expensive unless you are going to stay there for the whole day then it is worthwhile. I recommend you to sign up with a local tour. I did mine at their bus station.